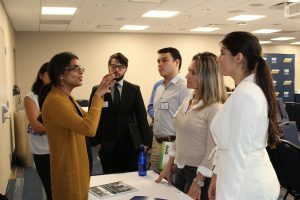 On April 10th, our department hosted “Day with Industry” in which we welcomed industry professionals from South Florida. Companies included Biorep, BioRASI, InnFocus, Texas Instrument, Medtronic, Zimmer Biomet, Tissue Tech, SHL Group, ImmunoSite, and Coulter Foundation. 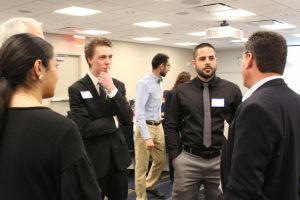 Between industry professionals, students, and faculty, we welcomed over 80 attendees who participated in a networking breakfast, keynote presentations, lunch, and a career expo. Our day began with the networking breakfast. The session started with a welcome speech from BMES student chapter president and a short life story from our guest from BioRASI. Students, faculty, and industry professionals mingled in a less formal environment during breakfast. Faculty and industry professionals were networking, sharing their experiences in academia and industry. Several groups of students approached industry professionals and heard about their experience and insights in industrial paths. 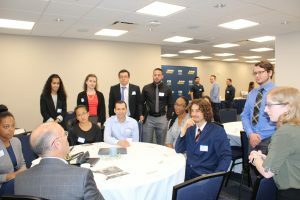 This casual interaction prepared students with more confidence for the third part of the day (Job Expo) and industry professionals had the chance to know BME students as interesting people that they are before they introduce themselves as applicants and potential employees in the Expo. Next was keynotes and lunch. The session started with a speech from Dr. Jung that introduced BME department and itsachievements and future goals. Dr. Raj talked about the formation of the Industry Advisory Board (IAB) and our guests from Zimmer Biomet, InnFocus, and Coulter Foundation talked about their story and involvement and inseparability of research and industry. After serving lunch, our faculty briefly explained their research fields for industry professionals and graduate and senior undergraduate students. Lastly, our students and industry guests participated in a Career Expo. This session was designed for junior and senior students to explore the job and internship opportunities within the present companies. The employers were provided with a booklet of our students’ resumes and they had one on one conversations with each student like an introduction interview. The event closed with a social coffee session.